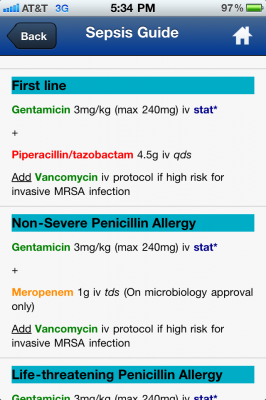 The management of infectious diseases, especially in the inpatient or ICU settings, can represent a challenging endeavor for physicians and pharmacists. 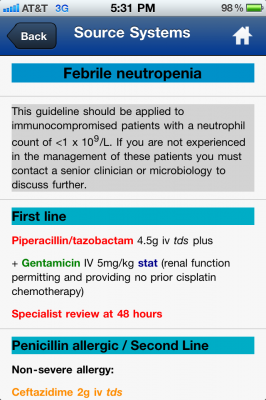 Florid urosepsis, pneumonia in otherwise healthy teenagers, helicobacter pylori positivity in peptic ulcer disease, clostridium dificile colitis, neutropenic fever, and newborn meningitis, for example, should all be managed quite differently in terms of both antibiotic choices as well as duration of therapy. 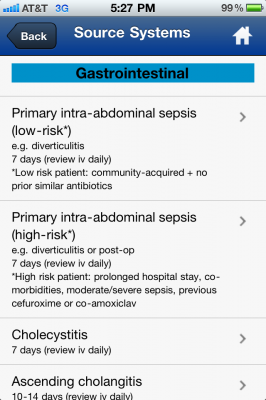 Given this often-complicated management of infections, junior doctors at the Southampton University Hospitals in the United Kingdom requested infectious diseases guidelines in a smartphone format for point-of-care use. 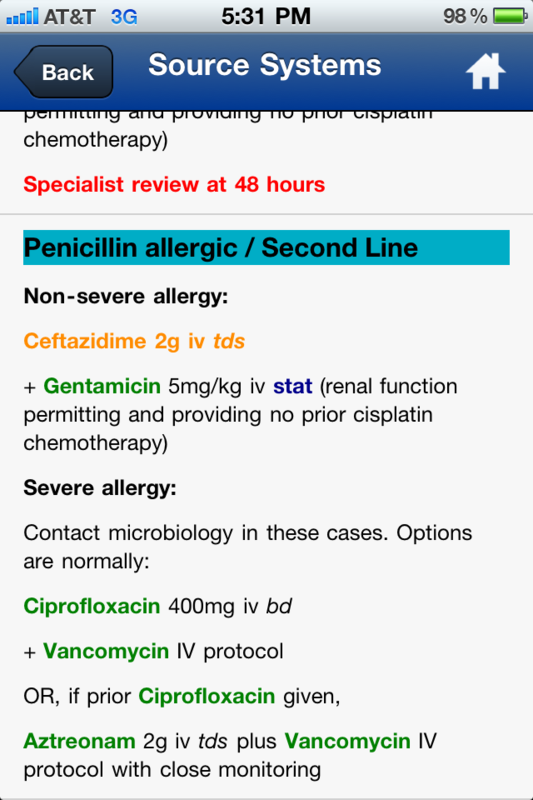 Heeding their requests, critical care physician Sanjay Gupta (not our CNN neurosurgeon), pharmacist Kieran Hand, and microbiologist Adriana Basarab, all from Southampton General Hospital, recently developed the MicroGuide app for the iPhone/iPad/Android to facilitate point-of-care assistance with the management of infections. 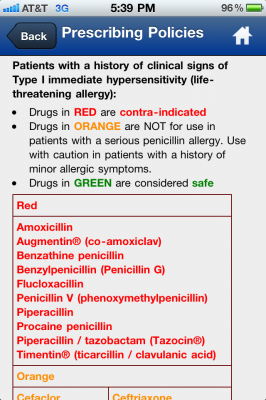 Previously, they had distributed a popular “Pocket Guide” with similar information to all new residents, pharmacists, and medical students. 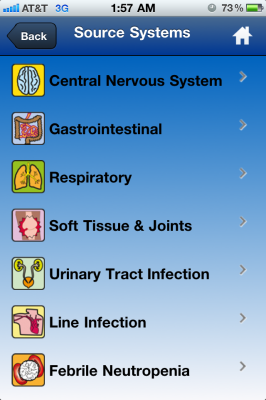 Lauding MicroGuide as the first medical app in the UK to “offer personalized decision-making support at the bedside,” , the developers have compared this app to a “sat nav for medicine.” Read below the jump to learn how the MicroGuide app, just released on July 26, 2011, can enrich your clinical approach to the management of infectious diseases. 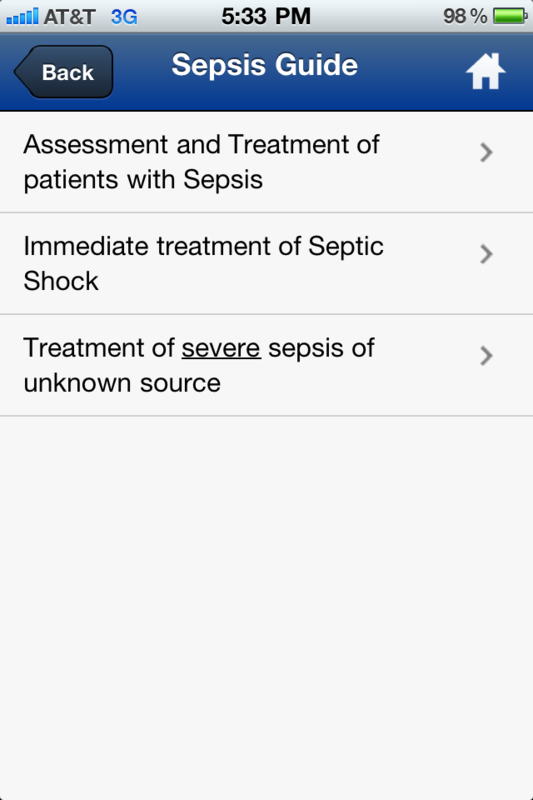 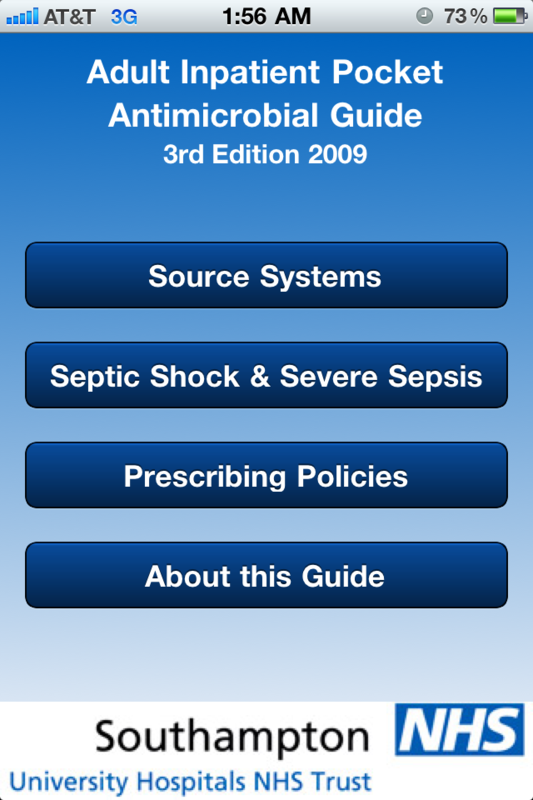 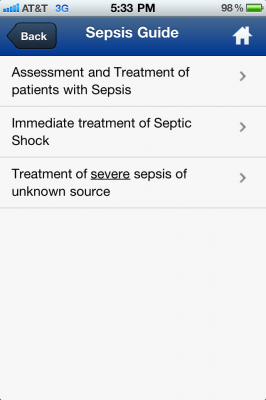 The MicroGuide app opens with a home screen featuring links to “Source Systems,” “Septic Shock and Severe Sepsis,” “Prescribing Policies,” and further information about the MicroGuide app. 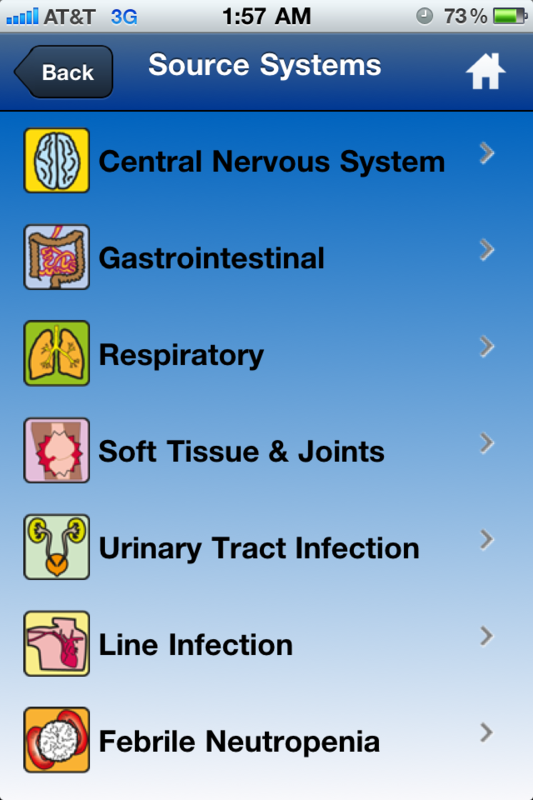 Clicking on “Source systems” features infections associated with various organ systems, as well as sections on line infections and febrile neutropenia. 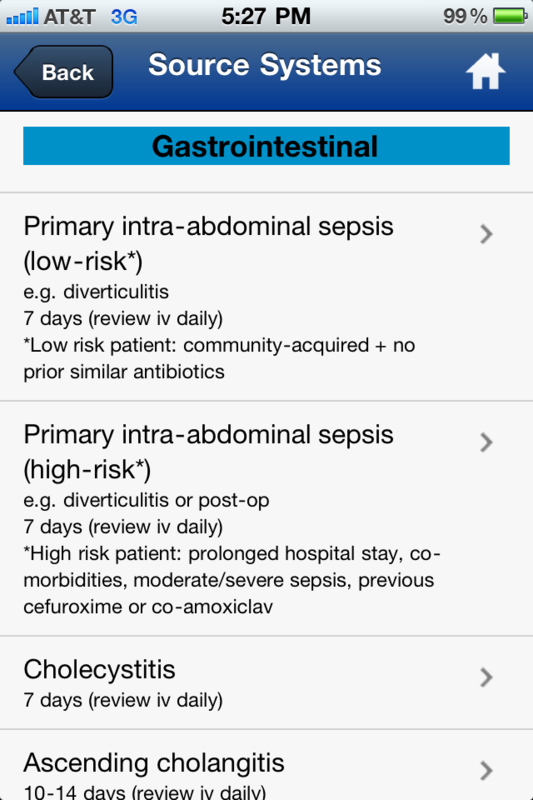 While there are many infections covered in this app, note the absence of tick-borne infections, fungal infections, and sexually transmitted infections. 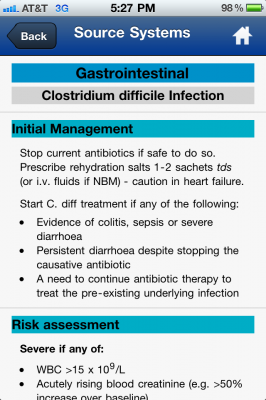 For example, let’s say you were faced with a likely case of clostridium dificile colitis, an example of a gastrointestinal infection. 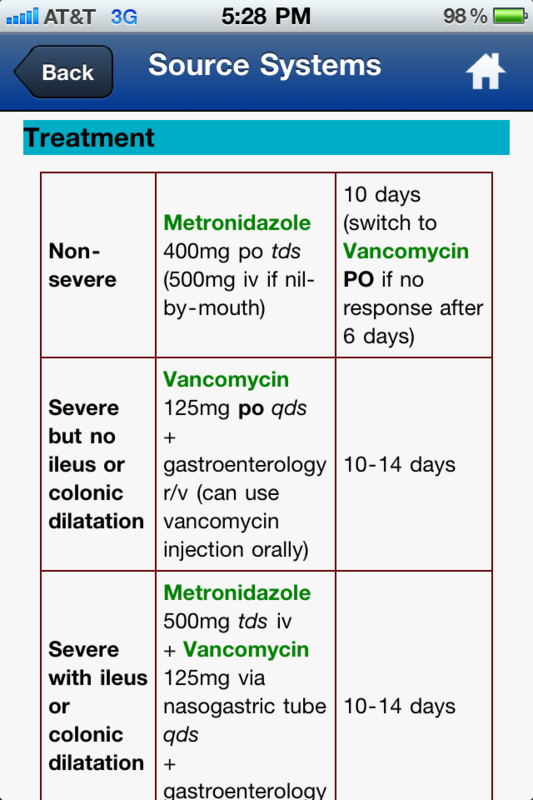 The MicroGuide offers guidelines for initial management and risk assessment in c dif infection before displaying treatment regimens (with antibiotic, dose, route, frequency, and duration) for various levels of infection severity, all in a concise, easy-to-navigate format. 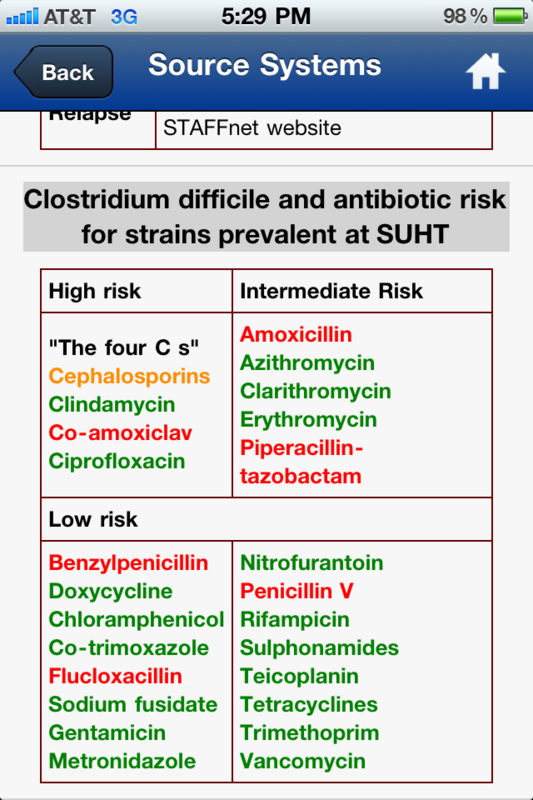 Moreover, the app also categorizes antibiotics into levels of risk for clostridium dificile infection (for the c dif strains prevalent at Southampton University Hospitals. 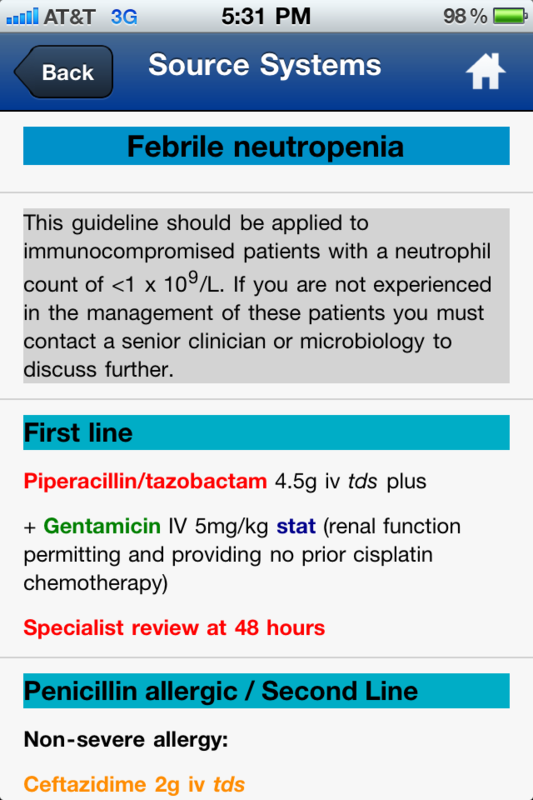 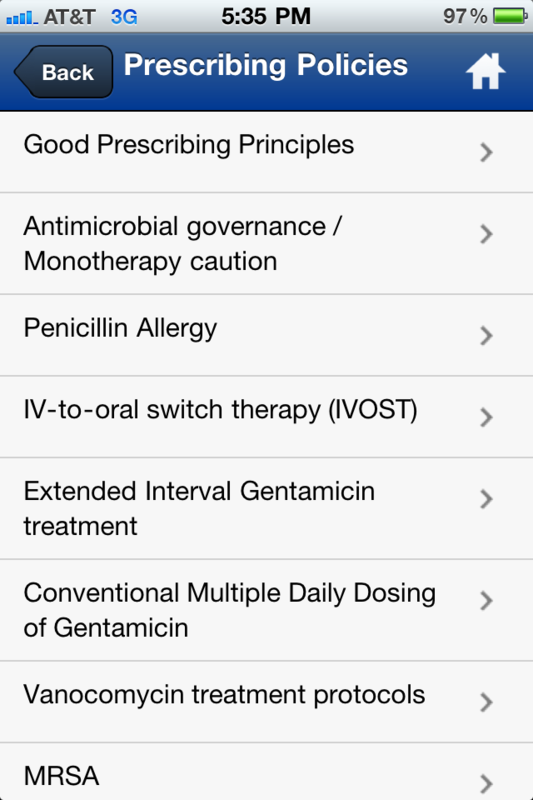 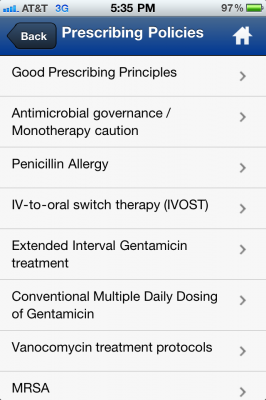 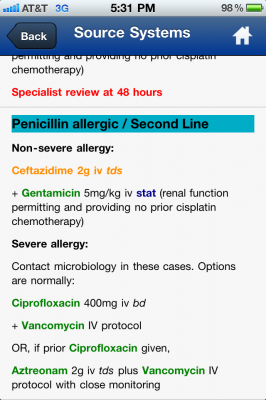 As another example, the app offers antibiotic regimens for febrile neutropenia, including regimens for non-severe and severe allergies to penicillin, an issue encountered surprisingly often in the wards or clinics. 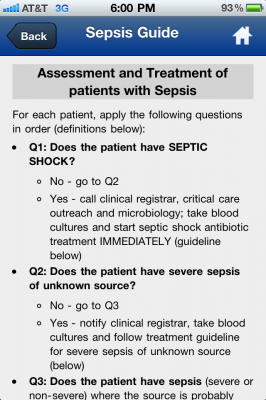 In addition, MicroGuide offers a guide to sepsis, featuring tabs on assessing and treating septic patients, the immediate treatment of septic shock, and treatment of severe sepsis from an unknown source. 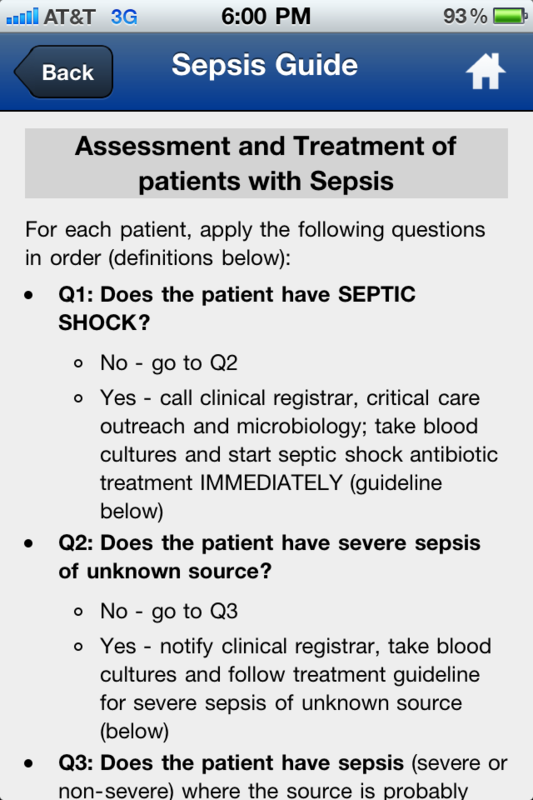 As seen here, the app’s sepsis guide features an easy-to-follow Q-and-A decision tree, including antimicrobial regimens for sepsis. 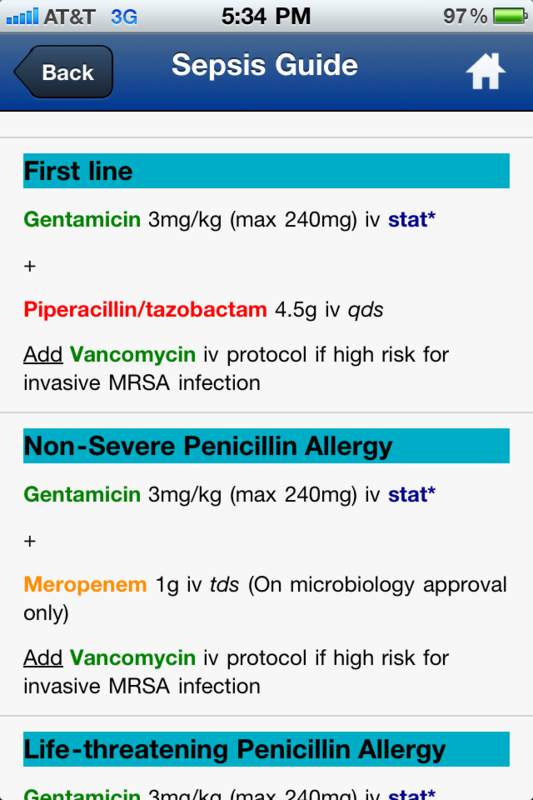 The “Prescribing Policies” section includes various modules of interest, including sections on appropriate antibiotic prescribing priniciples, penicillin allergies, transitioning from IV to oral antibiotics, gentamicin dosing considerations, vancomycin protocols, and MRSA (methicillin-resistant staph aureus). 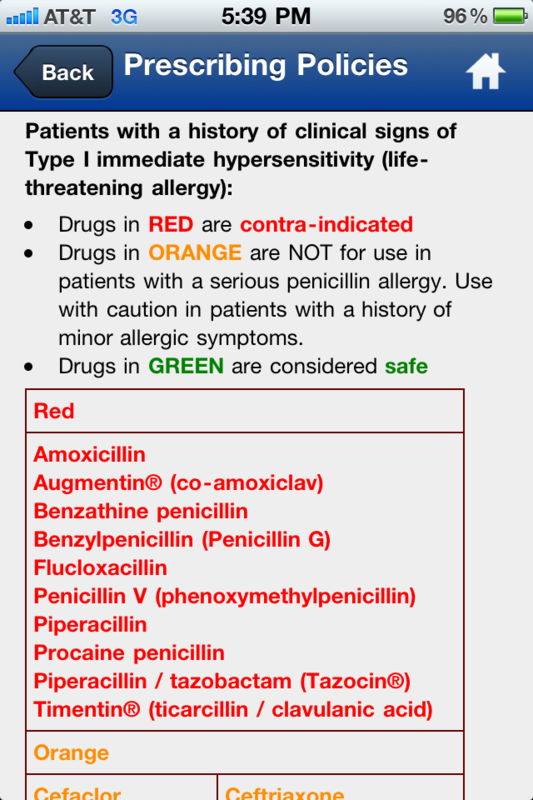 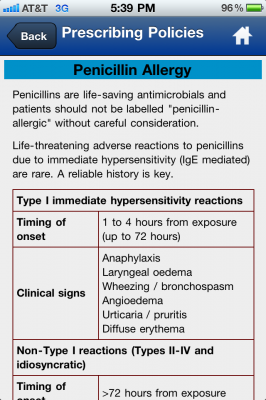 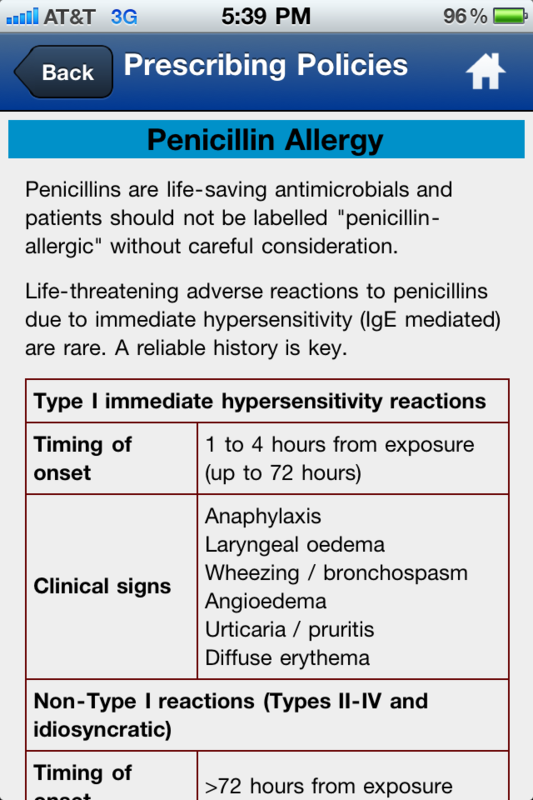 For example, the section on penicillin allergies describes the different adverse reactions to the administration of penicillins, and categorizes antibiotics into red (contra-indicated), orange (avoid in serious penicillin allergies), and green (safe) categories—a very useful reference tool. 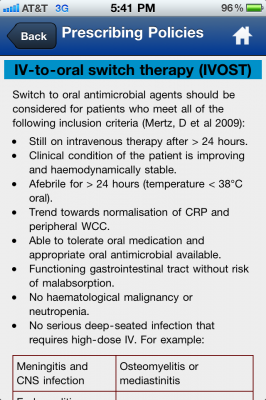 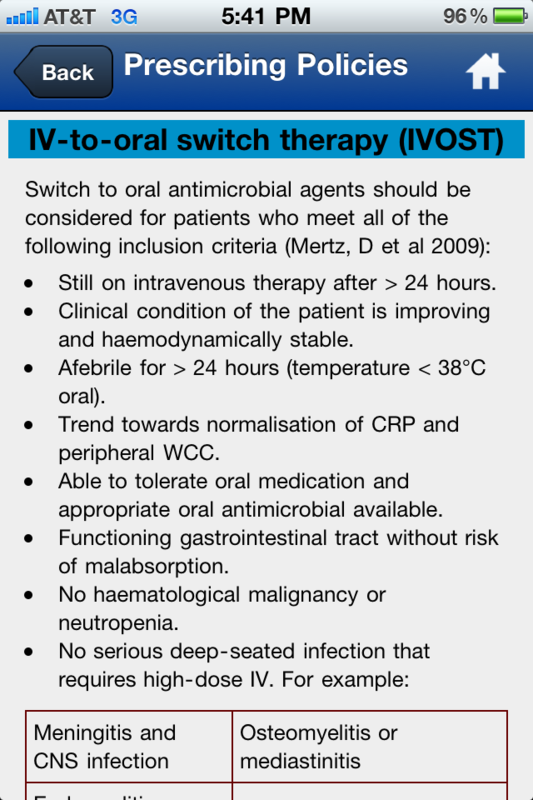 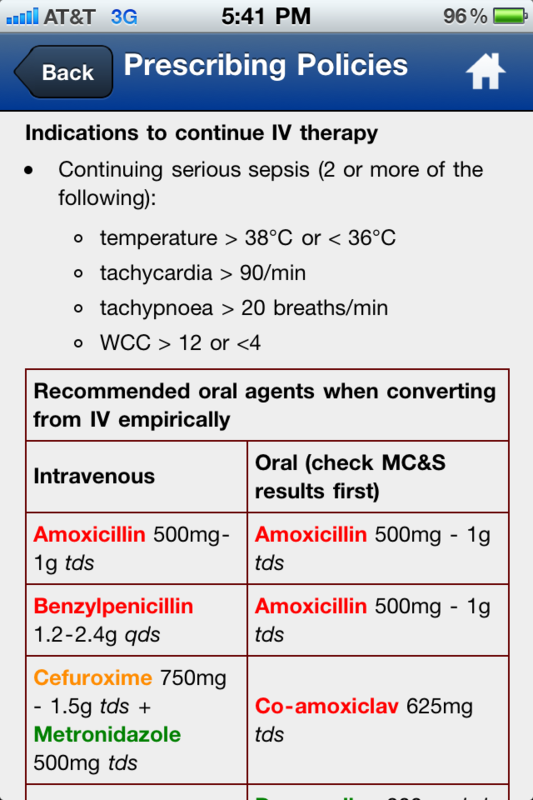 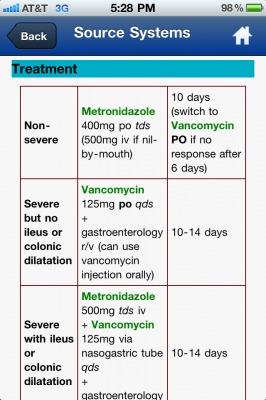 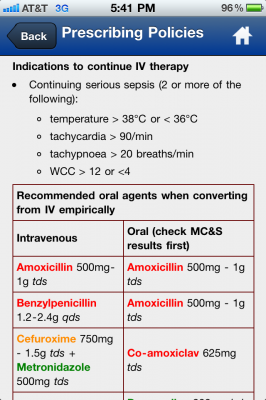 Moreover, the IV-to-oral switch therapy section include parameters for considering the switch to oral antimicrobials, as well as recommended oral agents when making the switch from IV antibiotics. 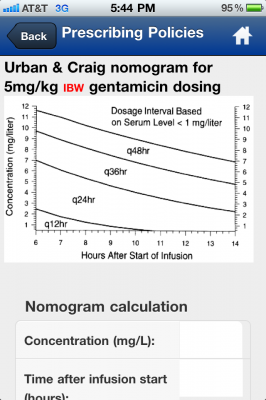 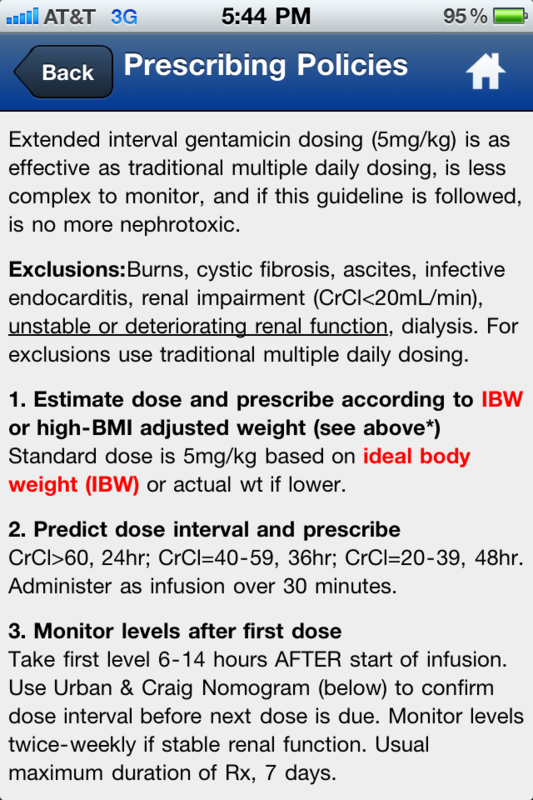 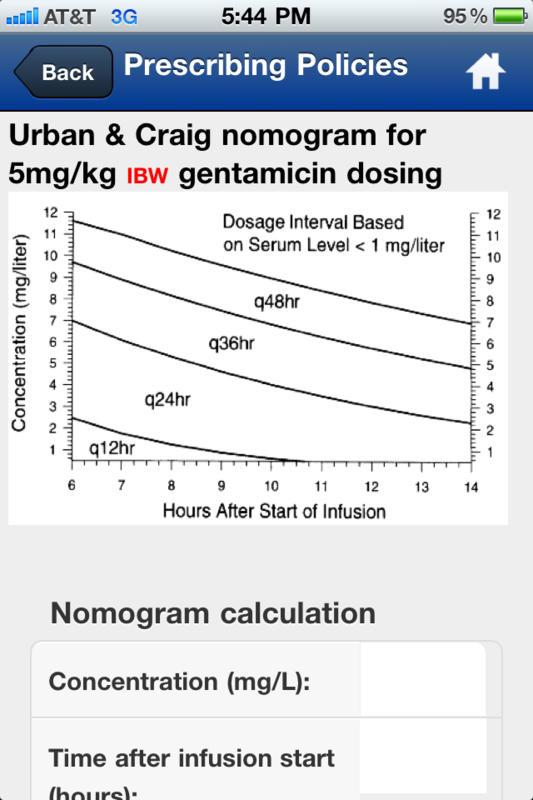 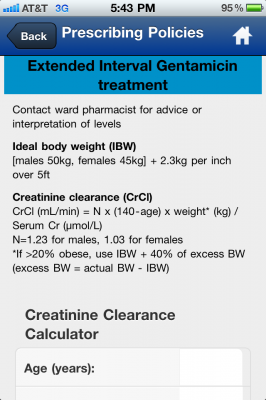 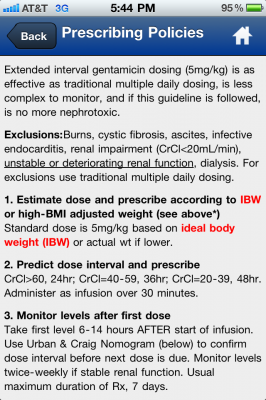 Finally, the MicroGuide also offers assistance for prescribing gentamicin (both extended interval and conventional daily dosing) and vancomycin, including calculators for creatinine clearance, vancomycin dosing based on creatinine clearance, and gentamicin dosing interval. 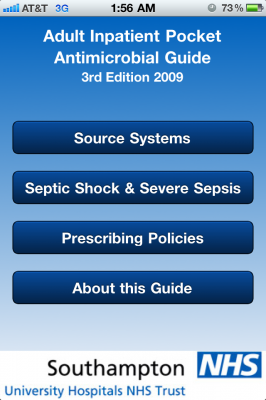 The MicroGuide app costs $0.99 in the App store. 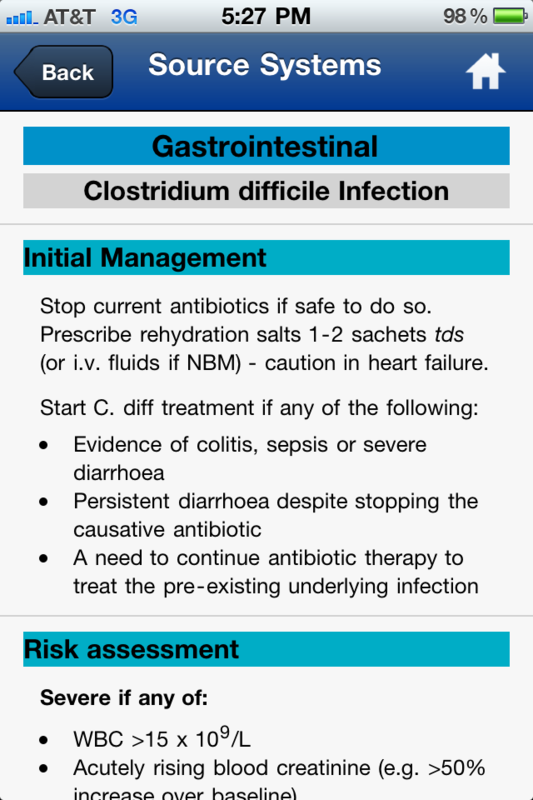 Developed in response to appeals from trainees, the MicroGuide app from Southampton University Hospitals represents an outstanding point-of-care bedside reference for all physicians who manage infectious diseases, and sets an example for other major academic medical centers to follow.